When young children begin to use crayons, their attempts reflect the early stages of drawing, sometimes just scribbles and shapes. This is OK because using crayons is a time for exploration with this art material, not judging what they have drawn. There are a variety of tried and true techniques that provide unique experiences and fun with crayons. Here are a few preschool ideas to add to your collection. Have an adult use a table knife to cut notches into the edge of a peeled crayon. By rubbing this crayon on paper the children will notice the effects of thick and thin lines. Take 3-4 crayons of different colors and tape these together. Just make sure the points are aligned. The children will enjoy using this rainbow-colored drawing tool. Think about taping together red, yellow and blue in hopes that when the children combine these colors they will discover secondary colors of orange, green, and purple when the colors overlap. You can also make bundles using thick crayons for a varied line width. Just remove the paper from the crayon and show the children how to hold the crayon on its side and twist it around to make a swirl design. This method is also good for showing children how primary colors can look like secondary colors. It’s an art method where you place points (dots) of two colors together and it appears to look like another color from a distance. For example, when filling in a section of a tree, the child can make dots of blue and yellow together and looking at the picture from afar it looks green. When using these art techniques, make sure there is adult help and supervision at all times. Take old crayons and peel off the paper. Break these into pieces and place them into sections of a muffin tin. Set the tin on a warming plate on low, just enough to let the crayons melt. Invite the children to dip cotton swabs into the melted crayon wax and paint designs on paper. Children love to do this project and see the effects afterward. Fold a sheet of white paper in half and instruct the children to draw a design on the one half only. Instruct them to press down hard, making a thick crayon coloring. When finished, fold over the sheet and have an adult iron over the page. It’s best to place another sheet of paper on top to keep the iron clean. Carefully open the page to see a symmetrical iron-on picture. Butterflies are a great example how coloring one half of the insect and opening up to see the entire picture of beautiful butterfly wings. This craft involves making shavings of crayon. 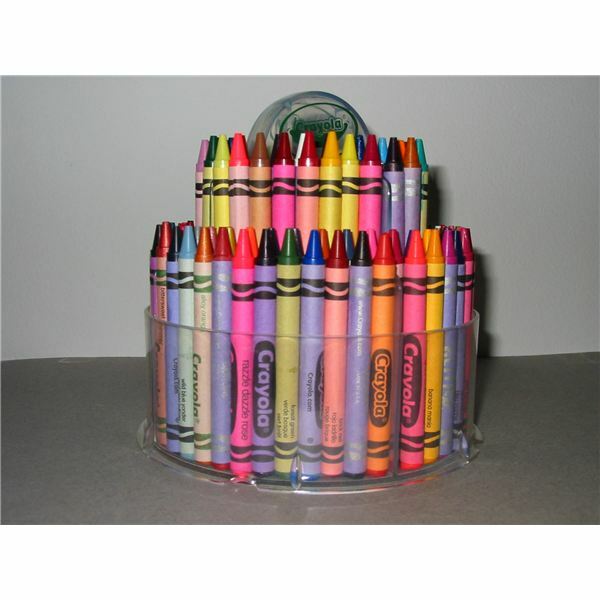 Provide the children with hand-held pencil sharpeners and have them shave peeled crayons into a dish. Take a sheet of waxed paper (folded) and invite them to place shavings in an assortment of colors onto half of the page. When finished, flip over the folded page and have an adult iron the page (covering with a sheet of paper to protect the iron). The teacher or children can cut these papers into shapes. Punch a hole at the top and thread it with yarn or ribbon. Hang this in a sunny window to view the brilliant colors inside. It’s amazing what you can do with crayons, especially old ones – so never throw them away. Enjoy these crayon activity ideas and maybe even brainstorm some new projects with your students.